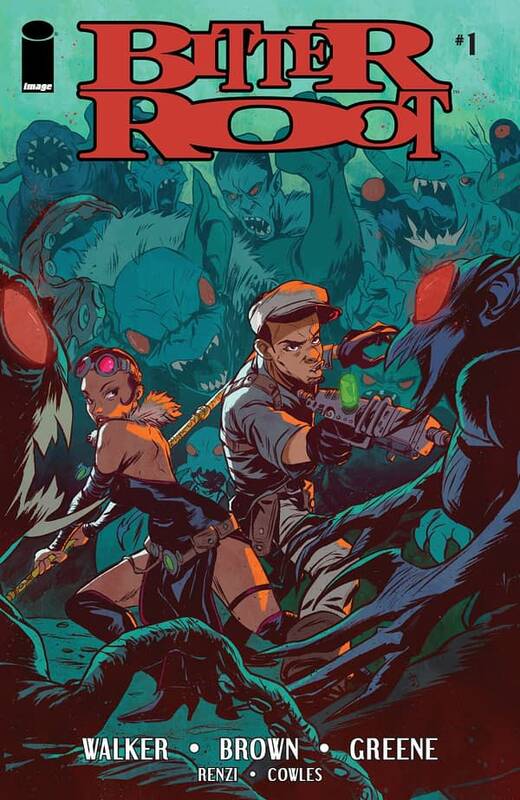 The former creative team on Marvel’s most recent Power Man and Iron Fist series – writer David F Walker (co-writing with Chuck Brown) and artist Sanford Greene’s new Image series Bitter Root debuted this week – and it’s a quirky fun book that seems to be reaching for some big themes. SUMMARY: Writers: David F. Walker & Chuck Brown, Artist: Sanford Greene, Color Artists: Rico Renzi & Sanford Greene, Letters & Production: Clayton Cowles, Cover Artists: Sanford Greene & Jarreau Wimberley, Editor: Heather Antos, Publisher: Image Comics, Release Date: Out Now, Price: $3.99. Set during the in the 1920s in Harlem the series follows the Sangreye family – Blink, Ma Etta, Cullen and Berg – as they fight people transformed in to literal monsters – or “Jinoo” – by hate. The metaphor (prejudice turns people in to monsters, duh) is so on the nose, it arguably doesn’t even qualify as one – but despite what the scholarly text piece as the back of this debut issue might lead you to think this is not an intellectual book or social treatise. 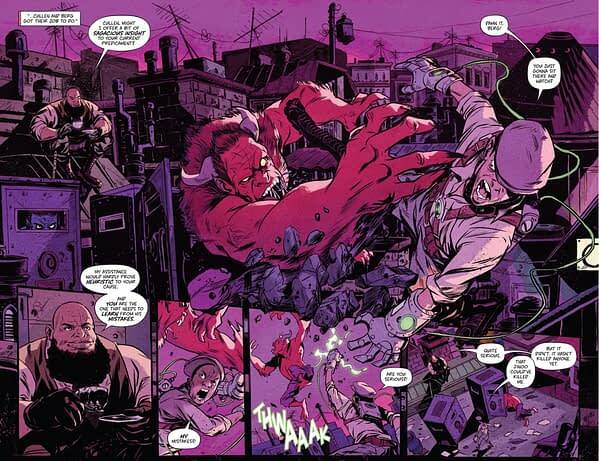 It’s a fun action adventure series – much more Hellboy than Optic Nerve – and on that level this issue definitely delivers. Most of that success is down to Greene’s kinetic and distinctive art. His work is broad and stylized – it’s the kind of cartooney art that you will either love or hate. I am definitely on the “love” camp – to me the monsters look cool, there’s a great balance of detail and sketchiness and the storytelling is crisp and inventive. Just look at the double page spread above – your eye flies across the page naturally following the monsters punch so that you zip through the narrative. So much about the characters – the older experienced teacher Berg and the inexperienced, nervous Cullen – is immediately implicit from the main image – it’s impressive work. This issue is a lot of fun but Walker and Brown clearly want to explore some serious topics with this series– racism and sexism are obviously touched on but the Harlem Renaissance setting is ripe with potential for interesting stories – so there’s plenty to come back for. There is also the fact that the last time a great Power Man and Iron Fist creative team went indy together comics was gifted with the legendary original Quantum and Woody series by Priest and M. D. Bright – so precedent suggests this may be one to keep an eye on.